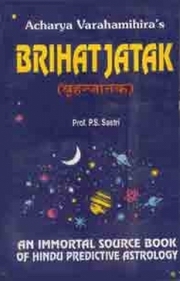 Brihat Jataka has over 407 Shlokas. The first in this book explains the technical terms and concepts. The second explains the characteristics, positions, relations, metals, qualities, places and natures of the planets. The third chapter deals with the births of birds, animals, insects and trees. This deserves an elaborate treatment and long research. The fourth chapter dealing with Nisheka refers to women’s conception, and other factors. Peculiarities of birth and Balarishta are taken up in the next two chapters. The seventh and eighth chapters explain Amsa and Pinda Ayurdayas. These have greater validity than the popularly used dasa systems in determining longevity. The ninth gives a brief account of Ashtakavarga. The tenth is about Profession. The results of the conjunctions of planets are explained in chapter 14th. The next one is about Renunciation. Influences of the constellations, lunar effects in the different signs, results of planets in various signs, effects of the planetary aspects, and effects of the planets in various Bhavas (houses) are dealt with in the next five chapters. Some special combinations are given in the twenty first chapters. Miscellaneous items are taken up in the next chapter. The 23rd chapter deals with misfortune. 24th Chapters is about Female Horoscopy which finds elaborate treatment in Saravali. The 25th chapter is about death. How to erect lost or unknown horoscopes is given a fairly good treatment in chapter 26. The 27th is about Decanates. The last one numerates the contents of the text. Brihat Jataka is a classic and one who does not master this text can never grasp the fundamentals of the science of Astrology. There are many translations of this text, and we have tried to offer a useful and valuable commentary.